Public Bulletin Check in at the Parks Canada Visitor Centres in Chéticamp (16648 Cabot Trail, situated on the west side of the park) or in Ingonish (37639 Cabot Trail, on the east side of the park) to obtain passes, information on visitor safety and any other information you may need, including a trail location map. Trail Rating Suitable for all skill levels. 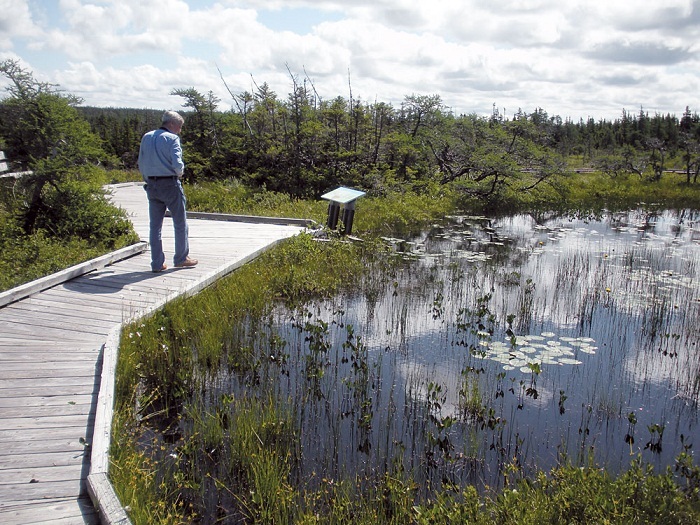 In keeping with Parks Canada's mandate to protect the natural environment, a boardwalk keeps your feet dry as you walk while preventing you from trampling the fragile life in this highland plateau bog. A self guiding trail, signs explain life here – pitcher plants, delicate orchids, colourful dragonflies, green frogs and gigantic moose. Eligibility All ages. Family Friendly Trail. Self Guided. Accessibility Fully Wheelchair Accessible - Wheelchair accessible interpretive loop; Ideal for baby strollers ; A park pass is required all year for hiking or use of other services in the park.